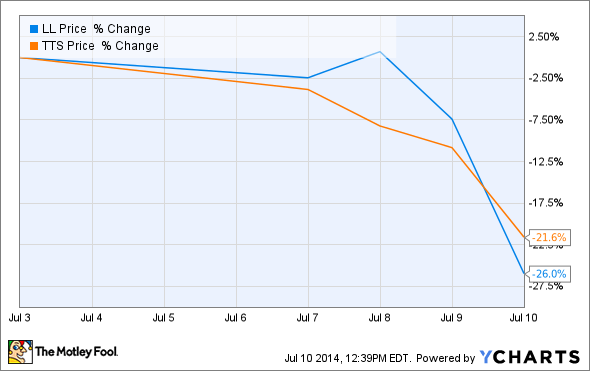 Here's How Lumber Liquidators Is Hurting Tile Shop Holdings: What Should Investors Do? Lumber Liquidators' early announcement of a terrible second quarter and reduced guidance for the year is hurting Tile Shop Holdings investors today. The reality is, Lumber Liquidators has "earned" the beating, guiding sales lower for the year, while Tile Shop Holdings is down based on nothing more than speculation and potential correlation between the two companies' results. The big question: What should investors do? Let's take a closer look. The important consideration for investors in either of these companies is that the housing recovery -- which is central to the success of these two companies -- is in the early stages, still. This year, the results have been mixed. The National Association of Realtors reported that May sales of existing homes increased a seasonally adjusted 4.9% over April; however, that rate was still about 5% lower than in May 2013. Sales in April were higher than March, but also well off last year's pace. It's too early to tell if Tile Shop is feeling the same pain as Lumber Liquidators. Source: Tile Shop Holdings. The Fed just announced it will end its bond-buying program this Fall, and it's expected that interest rates will begin to rise, so there's some concern that this will put further pressure on home sales. However, the NAR also is reporting that inventory levels are rising, which should result in home prices -- which have been rising sharply in many markets -- should start to flatten. This should help counter the effect of rising interest rates. In short, it's a lot of negative news and heavy speculation that things are going to get worse before they get better, and Mister Market is clearly voting that way right now. Credit Suisse said that they see Tile Shop's same-store sales as correlating with Lumber Liquidators', which is what led to the downgrade of Tile Shop's stock. The reality is, we won't know for sure if this was an accurate call until Tile Shop reports earnings in early August. Lumber Liquidators is partly blaming inventory constraints for its lackluster quarter. Only time will prove that out. Source: Lumber Liquidators. We also won't know how widespread the slowdown is -- if it's widespread at all -- until we hear from other retailers in this space. It's just too early to make that call. Final thoughts: What to do? As I said in this video earlier, probably nothing for now. I think the Foolish approach is to let a little time pass, and not act on price movement alone. 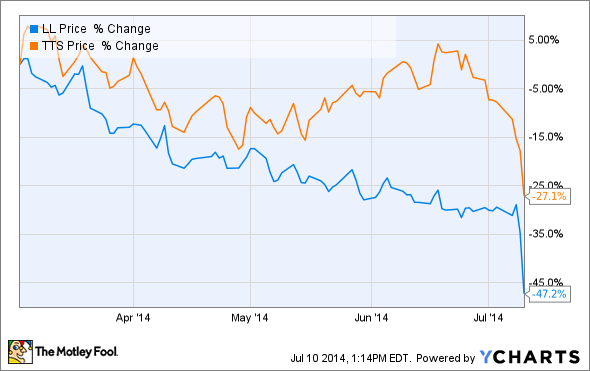 The reality is, we just don't know if Lumber Liquidators' results are specific to it, or a larger industry slowdown. Earnings season is about to get started, so the smart play is to take the time to learn what's happening in the greater industry. Are comparable sales down everywhere, or just isolated to a few specialty companies? If it's widespread, then it could be a good chance to buy shares while the industry is down, because we are in the upswing of a cyclical recovery, and the long term could be very rewarding. However, with Lumber Liquidators -- and Tile Shop Holdings -- It's probably worth waiting until we learn if -- and how much -- they are affected by the seasonal downturn. Things could get worse before they get better, and I'd rather leave a little upside on the table than lose money by acting before I really know what's happening with the industry. I'm holding for now.